Perhaps recognizing that a missed Christmas delivery could lead to much customer dissatisfaction—not to mention bad publicity—Barnes & Noble has informed customers who bought the Nook e-book reader that they may be eligible for a $100 gift certificate in case of delayed shipments. The gift certificate, which will be delivered automatically via e-mail, is intended for customers who have been promised a delivery date of December 24 (or earlier) by the company, but that will not receive the product in time for Christmas. Additionally, Barnes & Noble will send a “special Holiday Nook Certificate” to customers affected by the delay so that those who are receiving the device as a gift will know that it is coming at a later point. 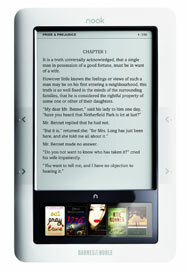 Announced in October, the Nook ran into shipping delays caused by user demand. Last month, Barnes & Noble delayed the retail release of the Nook and informed consumers that some Nooks wouldn’t arrive in time for the holidays. According to an e-mail sent by Barnes & Noble to inform affected customers of the possible delay, shipments that miss the December 24 delivery will be shipped by overnight courier and delivered on December 29, although any accessories may follow separately at a later date. The Nook may not have captured the top spot in Macworld’s just-released e-book reader review round-up, but there is little doubt that its release has sparked a significant amount of interest as the competition among various contenders in the electronic book market heats up. Earlier this year, Amazon released the Kindle 2 and Kindle DX, updated and upgraded versions of its popular Kindle device, as well as an e-book app for the iPhone. Meanwhile, Sony, the only major contender without a e-book reader capable of accessing content wirelessly, has announced the Reader Daily Edition, a Wi-Fi- and CDMA-capable device due for shipment right around the holiday period, although the electronics giant has not promised delivery in time for Christmas.